This pasta is seriously good. I’ve made it twice this week, and I am eating it right now. Bites in between typing. I’m risking a catastrophe that involves my keyboard, but that okay. 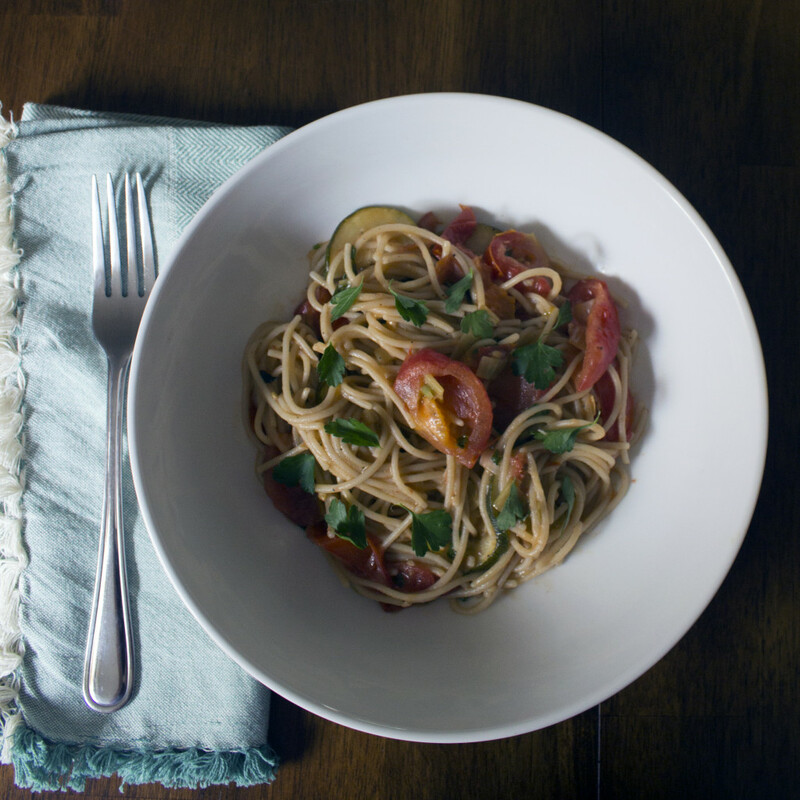 Because I am hungry and this super simple spaghetti is that good. Best of all? No processed pasta sauce from a jar that has “spices”, “flavors”, and other vague ingredients that may or may not cause you to get super bloated and swear off all pasta, for like, a week. Or maybe two. This sucker is totally fresh, and totally amazing. And it is easy! Oh my gosh so easy. If you can turn on your oven, boil some water, and chop some veggies, you can make this. Trust me. Oh, and also? It’s super pretty: See? Lovely. Keep this in your back pocket for when you need to impress someone on the fly. So head out to your garden (or your grocery store), and grab some tomatoes and zucchini. We’ve got delicious pasta to eat. This light and simple summer spaghetti is going to blow your mind. Trust me. 1.5 tbsp balsamic vinegar, highest quality you can find! Prep your veggies. If using larger tomatoes, go ahead and chop those up. Add to a 9x13 inch pan. Thinly slice the zucchini and leeks. Also add to the pan. Mince the garlic (I used a garlic press because life is short), and toss that in there too. Pour olive oil and balsamic vinegar over the veggies. Add your salt and pepper. If you like things a little spicy, go ahead and add a few dashes of cayenne or a small pinch of crushed red pepper. Mix it all up (I like to use my hands) and pop in in the oven. Set your timer for 40 minutes. Do some dishes, because we have a bit of time. When the timer has 20-25 minutes left, put your water on to boil. Salt the water generously. Seriously. Don't be afraid. Check the veggies, give them a good stir about halfway through cooking. Check the recommended cooking time for your pasta (usually around 7 minutes). When there is that much time left on the timer, add your pasta to the water. Stir occasionally to prevent sticking. Check the pasta when the timer goes off. When al dente, remove from heat, drain the pasta and add back into the pot. Take your veggies out of the oven, and add to the pasta. Add the basil and parsley. Combine until the tomatoes break apart and form a "sauce". This usually takes a minute or two of stirring. Serve immediately, piping hot. Add some freshly grated parmesan if you're feeling decadent. Goes well with a massive green salad, and a glass of red wine, but I'm sure that was obvious. A note on vegetables: This is a super versatile recipe. Don't like zucchini? Add broccoli. You can try thinly sliced carrots if you'd like, or asparagus. Or peas. The options are endless. Want some protein? Try adding a drained and rinsed can of garbanzo beans. Also goes really well with grilled chicken breast.